Produced by Kyle Sevier and director Colin Berry for the story's writer, E.M. Walker, as a short of showcase sample for his larger story, the nearly ten-minute short Shadow is the kind of microcinema project that makes you look at other projects and go "There are no excuses" when it comes to producing a quality short on an ultra-low budget. 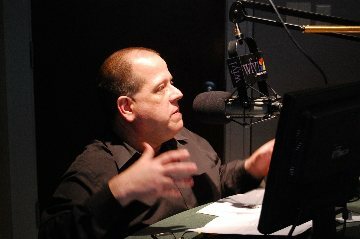 In sending the film to The Independent Critic, Berry had no problem acknowledging that he and his crew had worked overtime in trying to put together the best short possible on a budget that wouldn't likely pay for the toilet paper on a major Hollywood production. 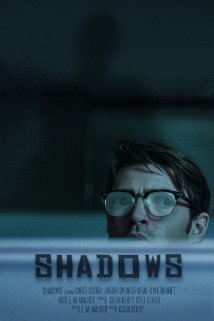 Shadows is a damn fine film centered around a lone office worker, played to perfection by Corey Sevier, who must work late into the night while dealing with an increasingly ominous presence. Shadows is the kind of film where you think you know what's going on. You might be right. You might be wrong. You're never quite sure until the story itself has unfolded and you're left mumbling to yourself "I want to see more" as the closing credits roll. It helps to have an actor the quality of Sevier in the lead role. Sevier never tips his hand, stringing you along through his fumbling paranoia meets supernatural awareness. It's a terrific performance, expressive in all the right spots and restrained in all the right spots. Spencer Gray's lensing is stellar and, quite honestly, it's rather difficult to believe that Shadows is such a low-budget film given Gray's ability to perfectly utilize, well, shadows. The film's visual effects, courtesy of Berry and Danielle Davis, are effective and for the most part avoid the cheesiness so often found in low-budget efforts. With post rumored to have been completed utilizing tools commonly available in Adobe's Creative Cloud package, this is a film that should prove to be an encouragement for up-and-coming filmmakers. Filmed on location in Toronto utilizing both the Red Epic and the Arri Alexa, Shadows is a film that builds the suspense and wraps you around its cinematic finger leaving you wanting more and hoping this is a story that gets the full treatment down the road. E.M. Walker's story is simple yet compellingly wrapped around an involving character whose every move is mesmerizing. For more information on Shadows, visit the film's Facebook page linked to in the credits to the left of this review.